For non-scientific admirers of wild orchids (like us), the nature and biology of orchids is a minefield of fact and fiction, supposition and uncertainty. Often, thrown in for good measure, is a large dose of anthropomorphism that ascribes all sorts of dastardly motives to the behaviour of orchids. 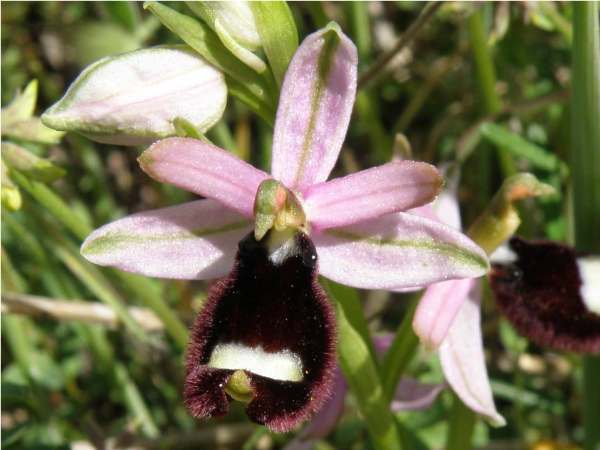 Those familiar with the First Nature website will know that we have a special interest in wild orchids, and in particular the native terrestrial orchids of Europe. Along with requests for help in identifying orchids found and photographed during holidays, we are frequently asked to explain some of the orchid anomalies that occur. These include hybridisation, and the occurrence of so-called ‘freaks’ or ‘monstrous forms’. We also receive many general questions about pollination, growth, and the structure of orchid plants and flowers. Below is a list of the most often asked questions and what we hope are straightforward answers. What is the structure of an orchid flower? What are the different methods by which orchids are pollinated? How do orchids that are not pollinated by insects survive? What causes hybrids, and what is a ‘hybrid swarm’? What causes freaks and monstrous forms to occur? Why won’t orchids grow in my garden if I dig them up and transplant them? What is an orchid ? We tend to think of orchids as exotic and complex flowers capable of all sorts of deception and trickery in order to attract pollinators. The truth is much simpler: plants that are not attractive to pollinators simply do not survive to pass on their characteristics to the next generation. Orchids are perennial plants, and the family of orchids (called Orchidaceae), which includes at least 25,000 species with more being discovered each year, is the largest and most highly evolved family of flowering plants on earth. The name orchid derives from the Greek word 'orchis' which means 'testicle' - a reference to the paired underground tubers of some species. In the case of native European orchids, two of their characteristics are flowers carried on a single stem, or inflorescence, and stalkless, undivided leaves arranged alternately along the stem. Regardless of the huge variation in orchid flowers they all share a basic morphology (visible form). Each has three sepals and three petals that surround the central reproductive parts of the flower. These petals and sepals (sometimes called tepals) are also referred to as the perianth segments. The three sepals consist of one dorsal sepal and two side (lateral) sepals, while the petals consist of two side (lateral) petals and third petal called the lip or labellum of the flower. The two side petals often look very much like the sepals. This makes it more difficult to understand the visual appearance of the flower. 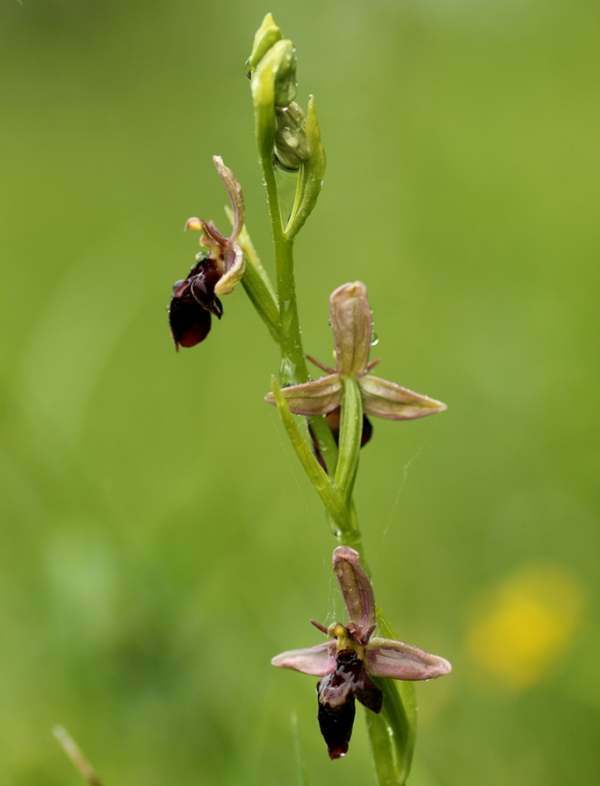 Fortunately, the lip – is very variable, and it is nearly always this part of the flower (and particularly so in the case of Ophrys or Bee Orchid species) that characterises an orchid. The lip is often larger than the petals and sepals, and its variability is not merely restricted to the pattern found there. The shape of the lip may be rounded, oval or almost square; it may or may not be lobed; it can be either convex or concave; and sometimes a ‘spur’ in the form of an elongated hollow ‘tube’ forms at its base. These spurs sometimes contain nectar, which attracts insects that pollinate the flower. The lip of an orchid flower nearly always points downwards, providing an easy ‘landing platform’ for visiting insects. 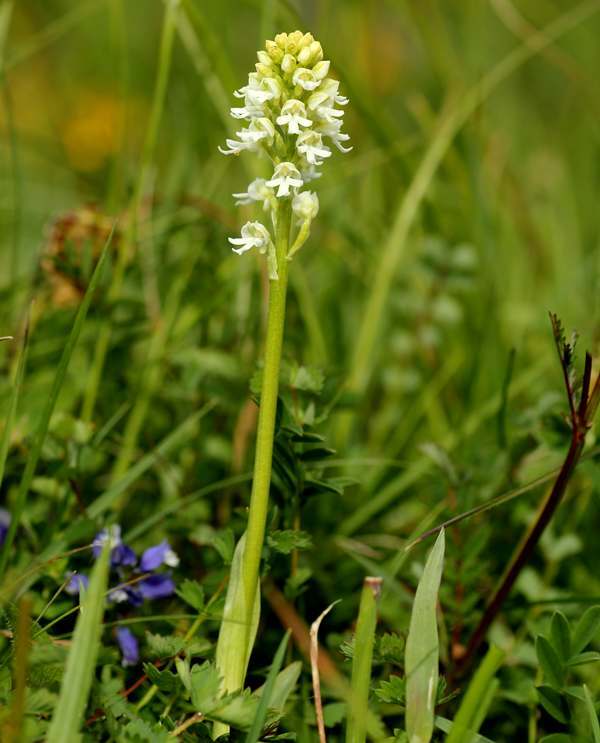 There are some exceptions, however, including the Fen Orchid (Liparis loeslii) and the Bog Orchid (Hammarbya paludosa), both of which are well represented where we live in Wales. In the case of the Fen Orchid, the flower is tilted backwards so that the lip is higher than the rest of the flower. Similarly, the Bog Orchid flower twists around to such an extent during its development that the flower almost appears to be upside down. 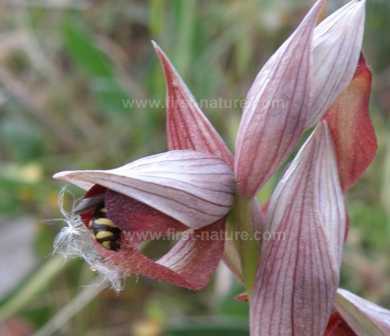 In Helleborines (Epipactis or Cephalanthera species) the lips of the flowers consist of two different portions: the tip or outer edge (called the epichile) and the inner or base part (called the hypochile). The hypochile is concave or cup-shaped, and the epichile is the flatter and wider part of the lip extending towards the tip. The two parts are further distinguished by nearly always being different colours. 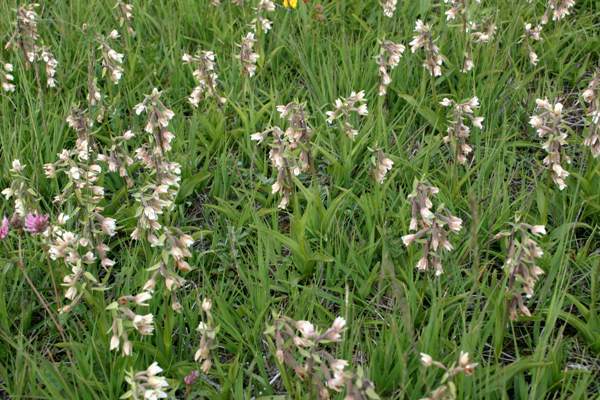 Left: this picture of Epipactis palustris shows the two parts of the lip - the cup-shaped hypochile at the rear and the wider part of the epichile at the front. A dead insect appears to have been caught on the sticky substance secreted at the base of the anther. In Bee Orchids, for instance, the two pollinia are secured to the anther by a pair of sticky disks at the base of the caudicles. The caudicles snap off when a pollinating insect visits the flower, and this results in the pollinia becoming stuck to the head or the back of the insect which then carries it off to an adjacent flower unwittingly completing a mission of cross-pollination on behalf of the orchid. In other species the pollinia and the sticky viscidium are covered by a thin membrane (known as a bursicle) that ruptures, exposing the pollinia, when disturbed by a pollinating insect. What are the methods by which orchids are pollinated? Orchids attract pollinators in three different ways - offering nectar as a reward to visiting insects, by appearing to offer nectar as a reward (called visual mimicry), or by sexual mimicry in which orchid flowers have evolved to look like, and in some cases smell like, female insects which results in the attracting of male insects of the same (or very closely related) species to land on them and attempt to mate with them. In all three instances the desired result is the same - the insects pick up pollen from one flower and carry it with them to another orchid flower of the same species nearby. It is these fascinating pollination mechanisms, resulting in such beautiful and diverse flowers, that lure thousands of people each year to go out of their way to visit and marvel at wild orchids. Below right: a pollinator pays a visit to Serapias orientalis found in Crete - or is it an insect simply sheltering from bad weather? In addition some orchids have a 'plan B' to ensure their continued survival in the event that they are not successfully cross-pollinated with other flowers by being able to self-pollinate. The Bee Orchid - Ophrys apifera -is a particularly good example of this, and it is thought that most Bee Orchids that grow in the UK and Ireland survive as a result of self-pollination. 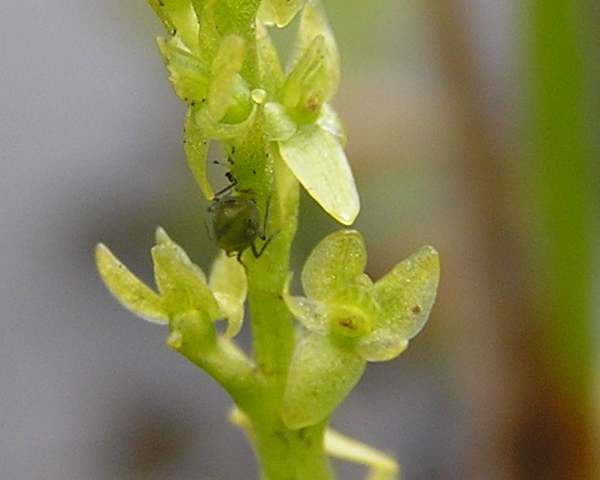 Another method of self-pollination in orchids is so-called cleistogamy where the flowers self-pollinate in the bud, sometimes even while beneath the soil. 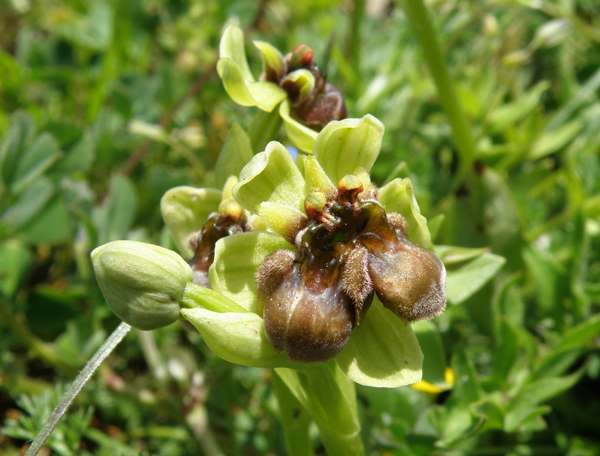 Orchids that are able to do this include some of the Helleborines (Epipactis) species, and also the Violet Limodore (Limordorum abortivum) and the Bird's-nest Orchid (Neottia nidus-avis). Some orchids are able to reproduce vegetatively, but this method of reproduction is the exception rather than the rule.Two of the UK species that are able to accomplish this are the Bog Orchid - Hammarbya paludosa - and the Musk Orchid - Herminium monorchis. 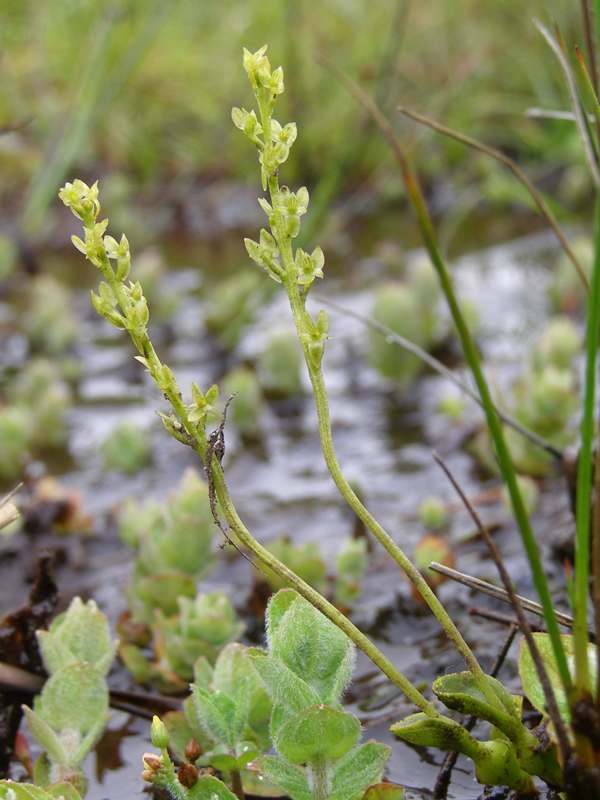 The Bog Orchid produces numerous small bulbils on its leaf margins which break off and may survive to produce new plants. 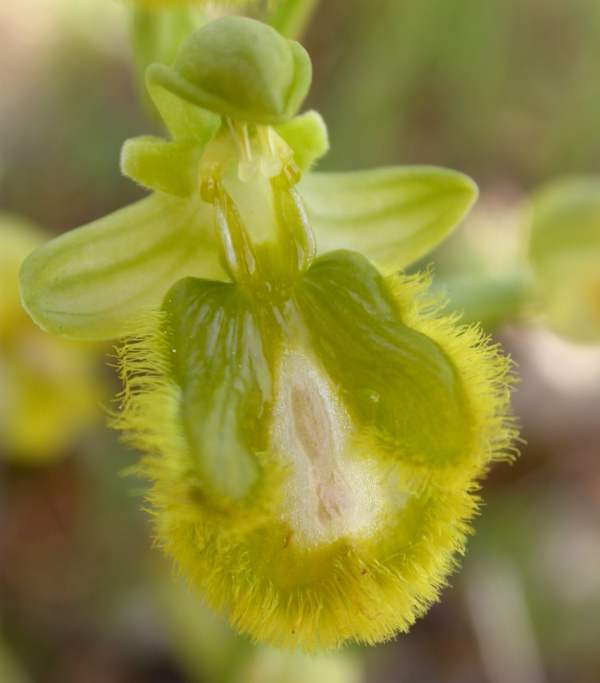 The Musk Orchid produces several stolons (horizontal shoots that grow away from the plant) which end in tubers which eventually grow into new plants up to 20cm from the original one. The fact that some orchids have the ability to reproduce vegetatively does not mean that they are not also able to reproduce as a result of being pollinated by insects. 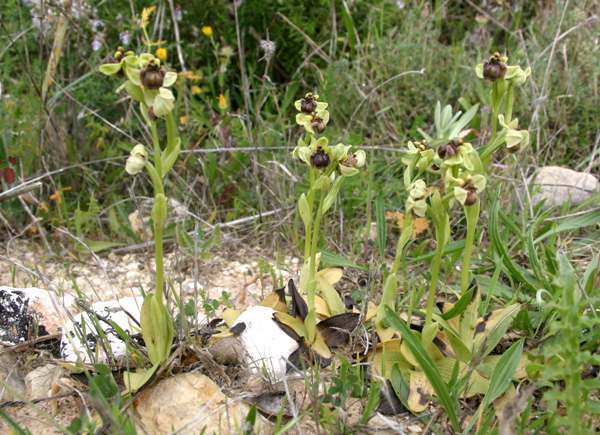 A unique example in the Ophrys genus that reproduces vegetatively is the Mediterranean species, the Bumblebee Orchid - Ophrys bombyliflora. This diminutive and rather insignificant orchid that could be very easily overlooked grows in such large colonies that their sheer numbers attract attention on an early spring walk in the region. They are particularly numerous in the Algarve region of Portugal. Since the vegetative reproduction and growth of orchids is pretty well covered above, let's deal with the growth of orchids that are either cross-pollinated by insects or self pollinated in this section. Orchids produce many thousands of very tiny seeds that are aptly described as 'dust seeds'. These tiny seeds decompose readily which is one of the reasons why it is hard to precisely establish how long orchids have existed on the planet. Each seed consists of an embryo which is surrounded by a hard casing which, in turn, is surrounded by an outer covering of dead cell walls, resembling a honeycomb structure filled with air which makes the seeds lightweight and easily dispersed by wind. While the lack of weight in the seeds can be seen as a major advantage in dispersal, their minute size means that they contain little or nothing in the way of food to support germination and growth of the orchid. If orchids seeds were to germinate on the surface of the soil their small size would result in them very quickly drying out due to exposure to sun and wind. Instead they wait until rain has washed them below ground surface, or until they are covered by dead leaves or other humus before they start to grow. It is unclear how long they can remain viable while lying dormant before germinating, although it is thought that European orchids start to grow in the spring from seeds dispersed in the autumn. There is another factor to consider, though - the fact that orchid seeds do not contain sufficient food resources to commence growth alone, and are dependent on fungi present in the soil to help them by providing the energy necessary to germinate. While some orchids will respond to a number of different fungi, some are dependent on specific species of fungus and cannot commence germination and growth without the presence of the particular fungus. When the conditions are right the fungus grows a very fine thread called a hypha which penetrates the orchid seed, and its embryo, through which it passes nutrients to enable the orchid to grow. Orchids are not alone in benefitting from such a relationship with fungi (described as mycorrhizal fungi), it is now known that many plants and trees have relationships with fungi which may be mutually beneficial, but which certainly enable the plants to grow much more quickly than would otherwise be possible. In the case of the relationship between fungi and orchids it may be that once the plant grows leaves and is able to produce energy through photosynthesis (producing energy from sunlight) the fungus receives nutrients from the orchid. Right: the Bird's-nest Orchid (on the left), a UK species, and the Violet Limodore (on the right), a Mediterranean species, both depend on a lifelong partnership with fungi, because they lack chlorophyll. The orchid seed is not completely overrun by the fungus and appears to have a mechanism by which it limits the penetration of the fungal partner to specific areas, and once growth begins the orchid produces a small structure called a protocorm which has fine roots. These roots also become infected with the fungus enabling the orchid plant to receive even greater quantities of nutrients from the fungus. As the orchid plant grows and produces leaves, which enables it to photsynthesise energy itself, it becomes gradually less dependent on the fungus, and eventually the relationship may cease completely. There are, however, some orchid species that remain dependent on a relationship with fungi throughout their lives, and these are the ones that lack chlorophyll (the green colouring in leaves) without which they cannot make food through photosynthesis. 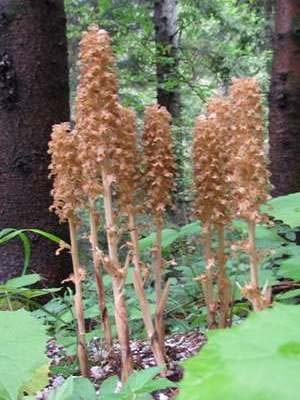 These species include the Bird's-nest Orchid - Neottia nidus-avis, the Ghost orchid - Epipogium aphyllum, and the Coralroot Orchid - Corallorhiza trifida all of which grow relatively dark habitats. All three of these grow in the UK, but there are orchid species found in Europe, the Violet Limodore - Limodorum abortivum, for instance, that behave in the same way. Some of the fungi with which orchids have beneficial relationships have, in turn, mutually beneficial relationships with other trees or plants in the immediate area, and this explains why particular orchids are only found in woodlands which contain specific types of trees. The Violet Limodore, for instance, has a particular association with pine trees, and the Coralroot Orchid parasitises on fungi associated with birch and willow in some places and pine trees in others. It seems that some orchids grow in woods not because of the trees and the shade and moisture they provide, but because of the presence of fungi that are dependent on the trees for their own survival. Once the orchid seed has developed into a plant, its lifecycle continues in much the same way as do the perennial plants in our gardens - if the conditions are ideal they will increase in strength and size and continue to grow and flower for several years. 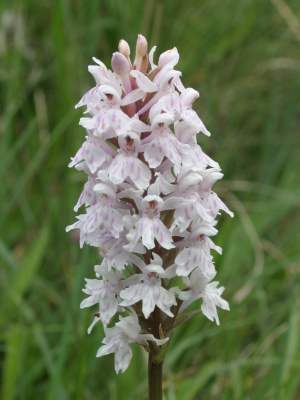 In the case of Dactylorhiza species (spotted-orchid species such as Dactylorhiza maculata, the Heath Spotted-orchid, which grows in the UK), the plants form tubers at the end of each flowering season in which they are able to store energy ready to use when they start to grow again the following year. 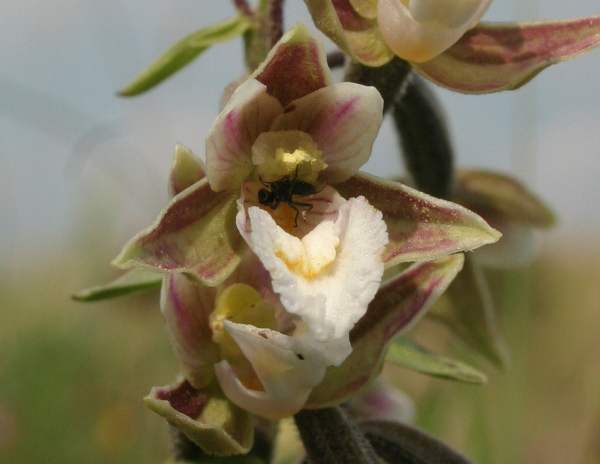 Other species of orchids (Helleborines such as Epipactis helleborine - Broad-leaved Helleborine - which grows in sand dunes and woodland in the UK) produce rhizomes (horizontal (usually) subterranean stems) which contain food resources to be utilised in the next growing season. These roots can extend underground for quite a distance - the Marsh Helleborine - Epipactis palustris - is particularly efficient in producing such extensive and lengthy underground roots, and the resulting colonies of these orchids are a magnificent site in late June and early July. Both the Bird's-nest Orchid and the Coralroot Orchid (both mentioned above) are so named because of the appearance of their tangled-looking rhizomes; in the case of the former the roots resemble a (badly made!) bird's nest, and the latter has roots that look like coral. As a general rule, European orchids grow leaves and flowers in spring and early summer which build up the energy reserves in the tubers or rhizomes (new ones are produced each year), rest through the heat and drought of summer (particularly in southern Europe) and the winter, and then re-commence their growth cycles the following year. 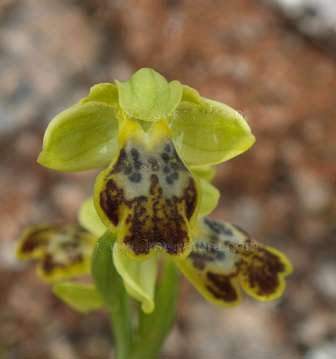 Some of the Ophrys species, particularly those in the Mediterranean region, grow leaves in the cooler winter conditions which have all but died back by the time the orchid flowers - a kind of belt and braces tactic that no doubt enables the orchid to take best advantage of moisture which may be in short supply by the time the flowers are ready to open. What causes hybrids to occur and what is a ‘hybrid swarm’? One of the most fascinating (and frustrating) things about orchids is their immense variability, even within species, which can makes accurate identification extremely tricky. Above - a hyrbid between Ophrys fusca and Ophrys lutea photographed in the Algarve in Portugal. Hybrids are common among the Ophrys genus adding to the difficulties of accurate identification. The native orchids of the UK do not present too much of a problem in this respect, but once you start studying orchids further afield, problems with accurate identification become more common, not least with orchids of the Ophrys genus. These orchids have evolved to be masters of sexual mimicry and they are able to fool potential pollinators. They have responded positively to selective pressure to change shape or smell in ways that have ensured their survival. Ophrys species also have a much stronger tendency towards hybridisation, perhaps lacking the barriers present in many other plants that prevent such 'accidents of birth'. Left - the Frog Orchid (extreme left) was found to readily hybridise with the Common Spotted-orchid (right) because of its genetic similarities with spotted-orchids. It has now been moved to the same genus. In the wild, a hybrid is the result of successful pollination when an insect carries pollen from one species or subspecies to another. In the UK hybridisation in the wild is rare except in the case of orchids of the genus Dactylorhiza, where hybrids can and do occur between closely related species - or even between some that we thought, based on their appearance, were not closely related! 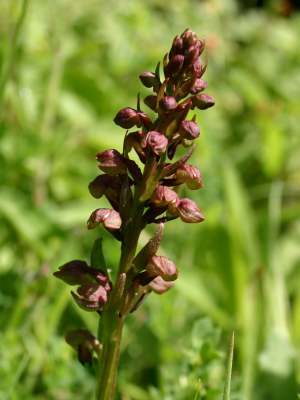 An example of this is the Frog Orchid, which was formerly known by the scientific name of Coeloglossum viride until it was recorded forming hybrids with other orchids, in particular those from the genus Dactylorhiza. 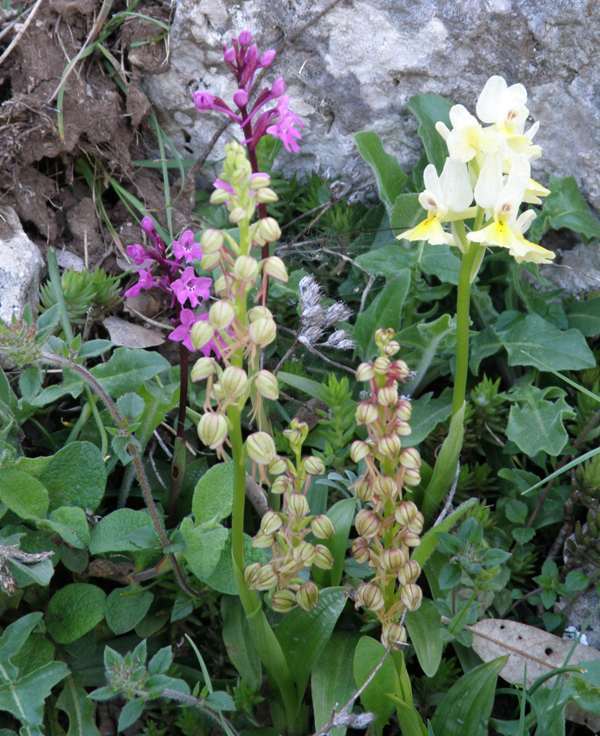 As a result of this, and based on genetic studies, this orchid has been recognised as sufficiently similar to Dactylorhiza orchids for it to be transferred to that genus and renamed as Dactylorhiza viridis. To find a recognisable hybrid in the wild is exciting. If you are so fortunate, be sure to take lots of photographs of it there and then, because its occurrence may be a 'one off' never to be seen again. 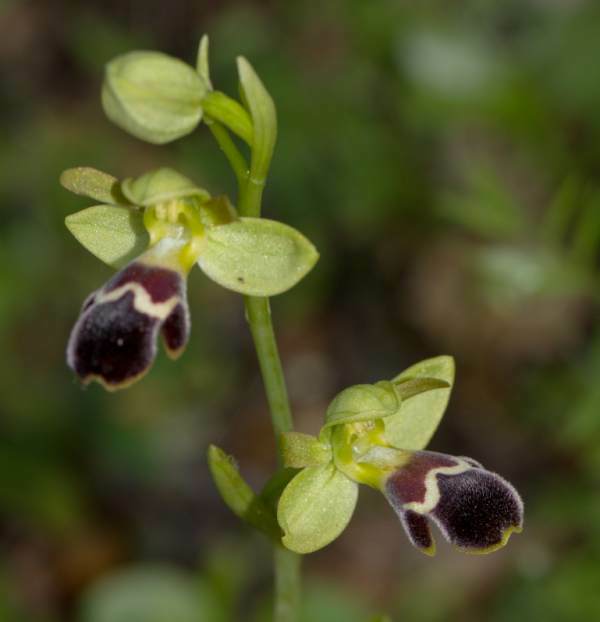 Whether or not such hybrids thrive and increase in numbers will depend on their ability to compete with the established orchid species and subspecies that surround them. Has it got sufficient of the visible and/or olfactory characteristics of either (or both) parents to attract pollinators? These insects may have very narrow or precise requirements, and without their unwitting support the plant will not be able produce offspring of its own. Could those offspring attract completely different pollinators and, as a result, respond to entirely new selective pressures? If so, over many years this might eventually result in the creation of a new subspecies or even a new species. It might... but the odds are always against it: if the going is tough for well established orchid species, it is even tougher for new kids on the block! For hybrids to survive beyond their initial generation they must be capable of interbreeding either with each other or with their parent species (a process known as backcrossing). The resulting colonies of orchids are extremely variable, often displaying characteristics that range widely between both parent plants. It is these blurred characteristics that make identification of the such plants so problematic. Vigorous and highly variable colonies of orchids that are a result of backcrossing with parent plants and interbreeding with each other are known as hybrid swarms. If, however, hybrid orchids survive and increase in numbers without backcrossing with parents and attract different pollinators, they will be subject to different selective pressures, eventually becoming a new species. Even more fascinating than hybrid orchids are the so-called monstrous (from the Latin word monstrum meaning monster) or freak forms that sometimes occur in the wild. Formally referred to as teratological mutants, such freaks are rare and seldom encountered in the UK. 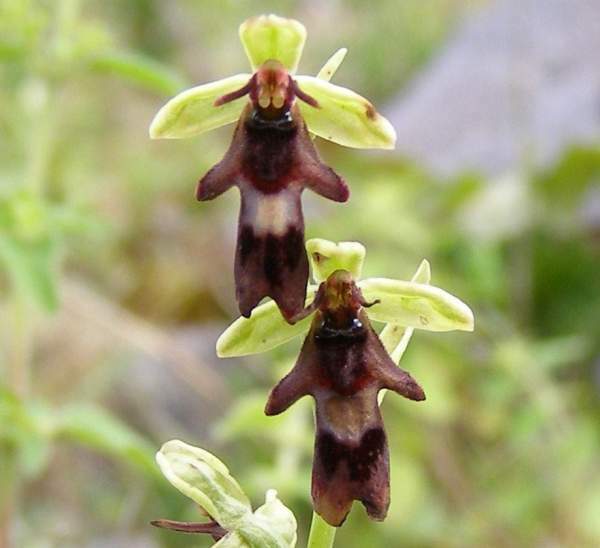 You are far more likely to see these unusual plants if you spend a lot of time looking at the various Bee Orchids of southern Europe. Left- this Bumblebee Orchid photographed in the Gargano Peninsula area of Italy has two lips which are fused together at the top. Such aberrations are more common in orchids of the Ophrys genus. Occasionally you will come across white forms or 'varieties' of common orchids such as the Early Purple Orchid (Orchis mascula) and the Early Marsh-orchid (Dactylorhiza incarnata var. alba). These are not to be confused with the true mutations described below, and they are often recurring phenomena appearing in the same places year after year. Left - a pure white form of the Burnt-tip Orchid Neotinea ustulata growing in southern England in May. Photograph by Elaine Hagget. Mutations often take the form of flowers with duplicated floral parts, as shown above in the Bumblebee Orchid with two lips, and below in the Tongue Orchid with two lips or tongues; or with lateral petals in the form of lips. Sometimes flowers will be inverted (upside down). The mutations seldom apply to all the flowers on an inflorescence; more often only one or two flowers will be affected, the others being quite normal. In such cases the mutations seldom reappear in the following year. Should an orchid plant produce flowers that are all mutants, it is more likely to continue into successive generations. There is evidence that the seeds of such plants may produce similarly mutant progeny. Mutation is not limited to the shape and size of the flowers but may also affect colour. Again, orchids of the Ophrys genus are more likely to produce mutants, and sometimes flowers lacking in the red and blue pigments occur and are white, yellow or green. These are called hypochromatic forms. Of those Ophrys species in which aberrant forms occur, the self-pollinating Bee Orchid, Ophrys apifera, is the one in which most freak forms are reported. As with inbreeding in humans and other animals, it seems that a limited gene-pool eventually causes mutations to arise. Environmental factors such as pollution in the soil, or late and severe spring frosts that interrupt the process of orchid growth and development of the flowers, are also likely to increase the occurrence of freak forms. Two other genetic abnormalities occur which cause strangely-coloured plants to appear - hypochromy and hyperchromy. Hypochromatic plants lack their normal colouring and appear as completely white, green or yellow. The dark pigments (anthocyanins) are completely blocked and this allows the white-to-yellow-to-green anthoxanthan pigments to dominate. This condition can affect the whole plant, the flowers or simply part (usually the labellum) of the flowers. This lacking of colour occurs more frequently in the Ophrys species of orchids but is seldom encountered in bee orchids in the UK. 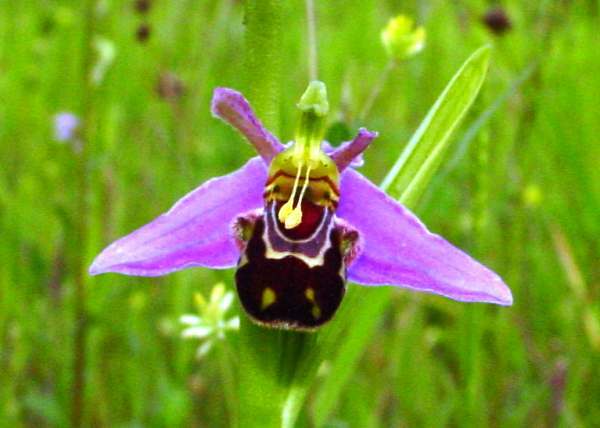 Those who spend a lot of time looking at bee orchids in Europe are more likely to encounter these strange-looking plants. Hyperchromatic plants are the result of the red-to-blue anthocyanin pigments becoming dominant creating dark and deeply saturated colours in the plants and flowers. This condition is found mainly in Orchis and Dactylorhiza species of orchids. In some places plants with this colour condition are so common that those displaying them are described as specific varieties or forms of species. Left - Bertiloni's Bee Orchid Ophrys bertilonii showing partial hypochromy on the labellum (lip) of the flower. Normally the speculum would be a glossy black stripe, but in this case it is completely white. 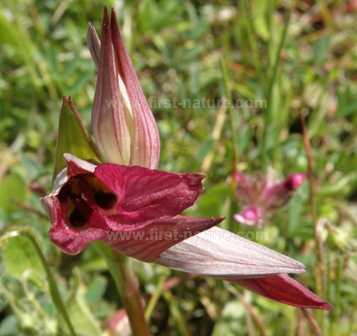 This specimen was photographed in the Gargano region of Italy in April. Why won’t orchids grow in my garden if I dig up and transplant them? 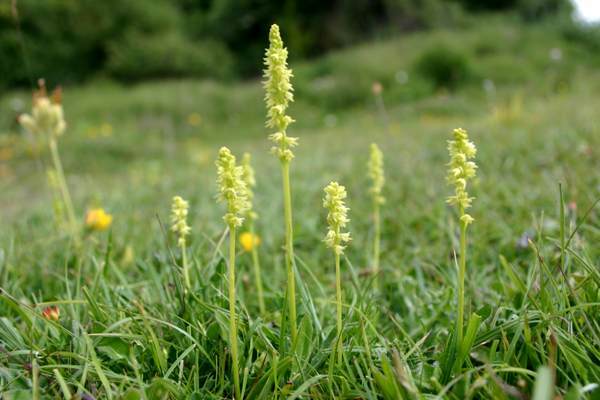 Nearly all the orchids that occur in the UK are, if not rare, at least threatened by many factors not least of which is the continuing destruction of their habitats as a result of farming and property development. Hedgerows are torn down, marshy areas drained, and ponds filled in. It seems miraculous that we have any wildlife left to enjoy at all. In the UK and Ireland we are lucky to have many special habitats protected by law and designated as special areas for the protection of our birds, flowers, insects and animals. Whether in a nature reserve or on a roadside verge, an abundant display of wild orchids does not mean that they are either common elsewhere or widespread. Indeed, you may well be looking at one of the very few places where such flowers still exist. For this reason the digging up and removal of any wildflower is an act of gross irresponsibility and selfishness. Left - a Tongue Orchid, Serapias lingua, which might more accurately be described as Serapias bi-lingua! All wildflowers are the subject of protection under the Wildlife and Countryside Act. For plants listed in the Red Data Book, even on your own land the digging up, or even removal of seeds, leaves, individual flowers or any part of the plant is illegal with serious penalites enforceable by law. In the case of wild orchids such selfish behaviour is invariably doomed, because these plants can grow only in very special conditions that are almost never replicated in gardens. They simply are not able to survive without their specific partnerships with other plants and fungi, which also require the kinds of special ecological conditions described elsewhere on this page. 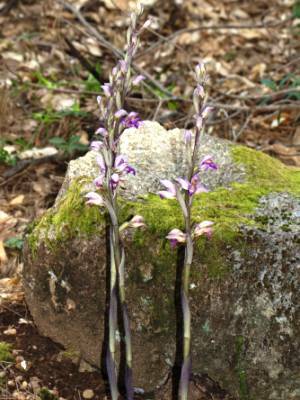 Wild orchids are rare, and so are the unique environments critical to their survival. In the meantime, enjoy orchids in the wild. Take home pictures to remind you of the wondrous sites you have seen and that others are able to enjoy after you have left.